If you are looking for employment opportunities, check on the following employment list for the best possible employment or job that may suit your qualification. The following are the job orders approved by POEA for overseas workers with positions like Household Service Workers, Domestic Helper, Househelp or Kasambahay in different countries except Saudi Arabia and Kuwait. Interested applicants may contact the assigned agency through the contact information on the link below. We do not process job recruitment and we are not affiliated to any of these recruitment agencies. To apply for jobs in Romania, please contact the agency assigned for the employment listing. We recommend that you visit the job listing website of their agency like their agency website or check their job board through their Workabroad or Jobstreet account which can be found on the contact details. We are not affiliated to any recruitment agency. However the list of job orders from POEA may at least help you find the best employment opportunity which are legal. To apply for any of the following employment listing or jobs in Singapore , please contact the agency assigned. We recommend that you visit the job listing website of their agency like their agency website or check their job board lisiting from their Workabroad or Jobstreet account which can be found on the contact details. 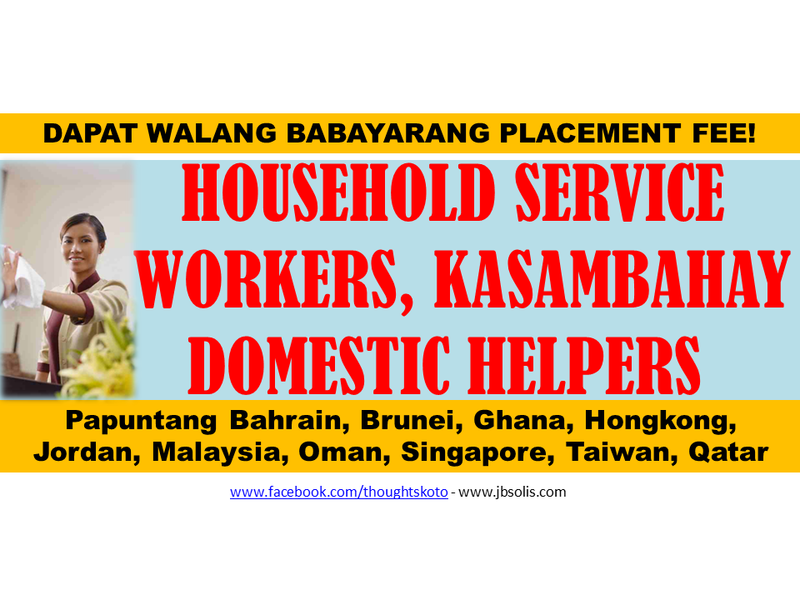 Household service workers or kasambahay bound anywhere abroad will collect no placement fee. As per rules set by POEA, there should be no placement fee for household service workers and seafarers. Recruitment agencies are only allowed to collect placement fee not exceeding the one month equivalent salary for jobs that does not fall into the no placement fee category . Any violation on this rule should be reported to the POEA. Violation on the recruitment and placement fee rule is ground for revocation of agency license. To apply for any of the employment listing or jobs listed above please contact the agency assigned. We recommend that you visit the job listing website of their agency like their agency website or check their job board lisiting from their Workabroad or Jobstreet account which can be found on the contact details.